Humans are good at surviving. Really good actually. There are just over seven billion (!!!) of us in fact, with more arriving everyday. And how have we done so well over the years I hear you cry? Well, have you ever considered chickpeas? Not really peas, and certainly not chicks, but fantastic nevertheless. These bad boy legumes are high in both fiber and protein, essential for good health and a strong digestive system. Humans have been cultivating them for around 11,000 years now (the humble chickpea) – and still do of course. They help protect against two of today’s biggest foes – heart disease and type 2 diabetes, and a whole host of other other malicious dangers (the enemies). This brilliant meal also contains spinach, which in itself is high in dietary fiber, protein, niacin, vitamins A, C and E amongst others (lovely spinach). It REALLY is the king of salads. And it’s another delicious one. We don’t waste our time with crappy, bland foods – we want taste and we want health. Half the people we tell don’t really believe us that salads can truly be tasty – until they try this. What are you waiting for? Surprise yourself and anyone who’ll listen, and do your body a favour at the same time. You won't believe this tasty bad boy is actually good for you! Ready in 7 minutes, high in protein, fiber and absolutely delicious. Perfect for a quick lunch. I don’t see an oil ingredient, but I’ll add olive oil. Looking forward to making this tonight. Thanks! And you’re absolutely right, somehow the oil went missing between the video and the recipe…thanks!! Made this for dinner this evening. I added a handful of cherry tomatoes as well. It was delicious! Thanks for the recipe! I’m pinning this recipe! 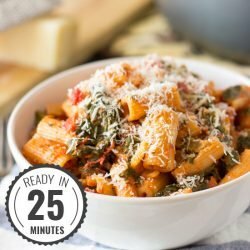 Will make this for lunch – this is the first time I’ve come across a recipe and have all the ingredients in my cupboard, lol! Great share! 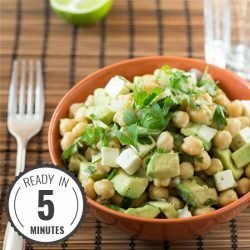 I love chickpeas and was pumped when I saw your recipe! I love the ease of it. I also think it would keep really well if taken to school or work. I featured it in my latest post, “Kick Start The New Year #3: 15 Healthy Lunches”! Made this recipe the night before, was off-put by the acidic smell (used all fresh, just purchased ingredients). Took it to lunch the next day, spinach was fine, garbanzo was fine, but oh god, the raisins tasted the way they smelled (bile). Dumped it all out. I don’t recommend it, but all the other reviews say otherwise. Do as you wish. what a bummer you didn’t like the salad!! I’m pretty sure something went wrong. 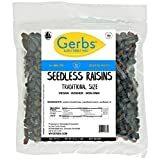 Funny enough, I loooove the taste of these raisins when the salad stands for a day. It’s awesome when they are soaked in the dressing. Is the nutritional info listed on this page accurate? Is one serving 689 cal (and so forth), or the entire salad? An awful lot of fat for a salad! No need for 40g per serving lol I think you should modify the dressing, the oil is killing it. I don’t see anything wrong with 2 tbsp of olive oil for one serving. Made your salad tonight and wow – it really is super easy! I did modify it by cutting the dressing in about half and adding both the lemon juice and the white wine vinegar. I also only added about 1 teaspoon of oil. I also added little orange tomatoes I had and subbed the raisins for dried cranberries. Was plenty of dressing for me and tasted great! For all the people out there complaining about the oil its pretty simple to just use less! Thanks for the recipe. I’ve never added little tomatoes but I bet they fit great. Thanks for the tip! Thanks Nancy! It tastes it too 🙂 I actually hadn’t had it for a few weeks but I had it again yesterday, it reminded me how good it is!! Have you tried making it with kale ? I’m sure this salad works with kale too. I LOVE this recipe. 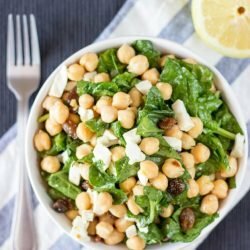 It’s become my go-to salad because it is SO easy yet so tasty and unique! 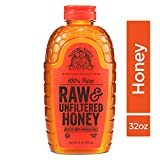 My only suggestion: 4 tbsps is A LOT of olive oil. I’ve adjusted it to 2 tbsps and kept the other ingredients that same, and it does not affect the taste whatsoever. Also, don’t not add raisins because you were too lazy to get them from the store, the sweetness really compliments the salad! Thanks so much for your feedback!! Its awesome, used gorgonzola ,added grape tomatoes and sunflower seeds. I also used gorgonzola and also added craisins and pecans and everyone loved it! This looks so good! I made it tonight to take to work tomorrow. I put the dressing in a separate container and will add it tomorrow. I also used cranberries because I prefer them to raisins, and I left out th cheese because I hate cheese. It looks so good, and most of the reviews are fantastic, so I’m looking forward to it tomorrow! I really hope it turned out as good as you hoped for. I personally find the cheese quite refreshing in this salad. A non-dairy alternative could be avocado though. Thanks for trying out the salad, Laura! This is great! I used half the oil and it was still plenty, Maple syrup instead of honey, and sundried tomatoes instead of raisins. And went with the lemon and cayenne options. So good! I just made this for lunch and it was very good. Thank you Anastasia! Glad you enjoyed it, it’s a stayer in my lunch circulation too! Eating this all week long on night shift, so good! Glad you like the salad, Ariane! Surprisingly good! Will definitely make it again. Thank you! Even after nearly three years I still make it once a week or so :). And it gets quicker every time, also a bonus! I made it! Loved it but added extra lemon and would only do 3 tbs of olive oil next time. Thanks for a yummy and healthy salad! I love this chickpea salad but i do not eat cheese . What can i replace the cheese with? I use them often as a “feta-replacement”. 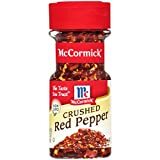 Can someone suggest a less spicy alternative for the cayenne/chili flakes? I can’t handle super spicy food. 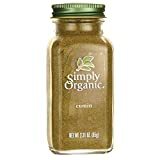 Also, chili powder adds a lot of flavor but it is mild unlike cayenne…at least the kind they sell in bulk spices here in the US. Is this meal really 658 kcal per portion? Seems high for the ingredients listed. I’d be surprised if one portion is much more than around 350 kcal. Can anybody confirm the kcals for one portion of this meal? 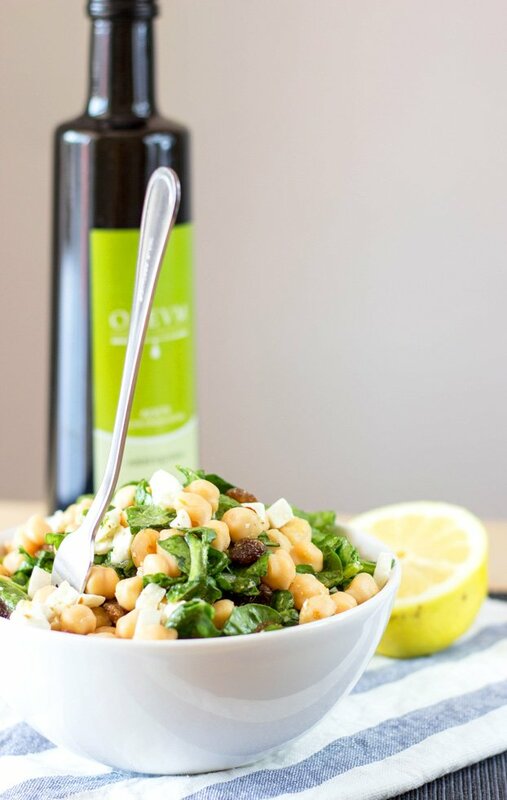 You could make the salad lighter by just omitting a tbsp of olive oil and reducing the honey. 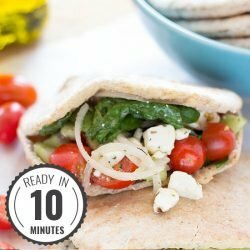 just wondering if anyone has tried goat cheese instead of feta. This-was-awesome! I wanted to eat the whole thing! And…I added toasted almonds as well. Thank you, thank you, thank you!! Yay, that’s awesome, Nicole! We’re happy to share this recipe (and meal plan) with as many people as possible!! So, I cooked some chickpeas and went on the ‘hunt’ for the recipes and ended up at your site. 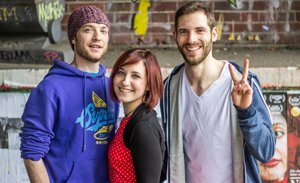 Your videos are awesome: Clear directions and simple to follow. 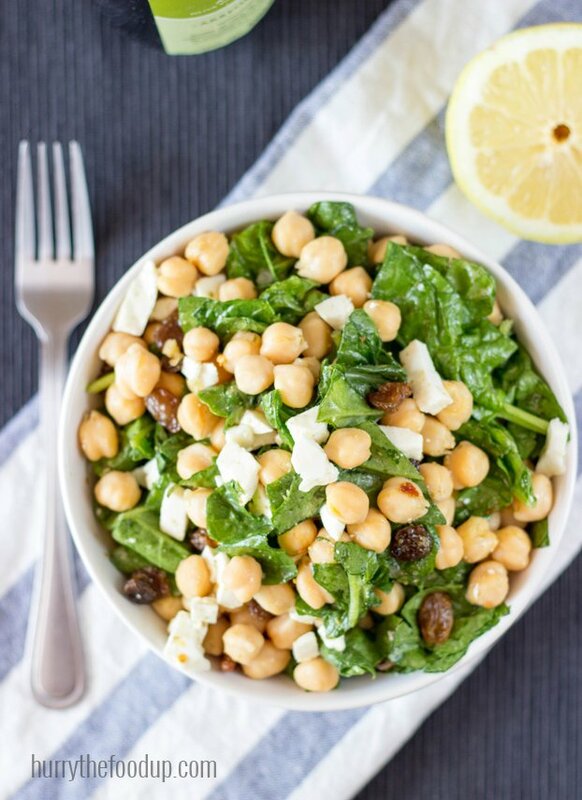 That spinach salad with garbanzos looks fantastic. 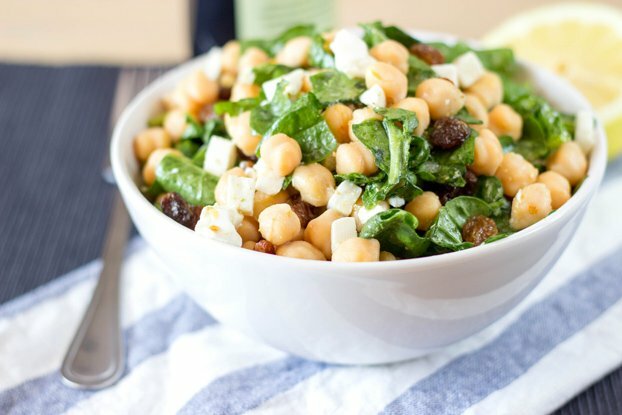 Question: Have you tried both cow and goat feta for this salad? Which do you like better? Tonight I’m going to make the curry and rice dish. Another friend gave me a HUGE bag of short grained brown rice that she got at one of our HUGE American superstores. So, I”m going to make the curry dish with this and my dried basil and see how it turns out! THANKS for giving me an idea of something EDIBLE and TASTY that I can make with all these chickpeas! I had this salad with both, cow and goat feta. I prefer the goat version. But goat cheese is a little more expensive.